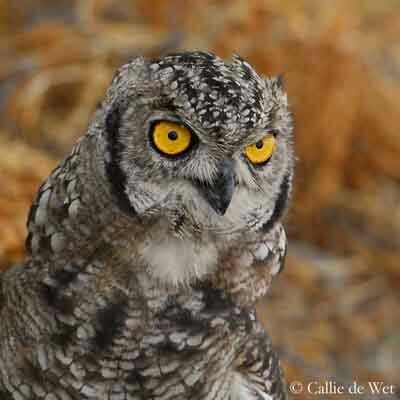 Spotted Eagle Owl is a medium to large owl, with yellow eyes and prominent ear tufts. We can find two forms, grey and brown. Spotted Eagle-Owl adult in grey morph has grey-brown with white spots mantle, and grey barred buff back and rump. Flight feathers and tail are dark grey with broad paler bars. Underparts are white, finely barred with grey. Throat is white. Underwing coverts are white with fine grey bars. We can see dark, sooty blotches on chest sides. Flight feathers and tail are white with dark grey bars. Facial disk is whitish finely barred with grey, and with black rim. Ear tufts are long and blackish. Bill is black. Eyes are yellow. Feathered legs are white with fine pale grey bars. Bare feet are dark brown. 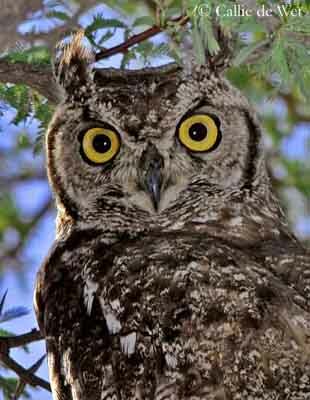 Spotted Eagle Owl in brown morph has browner plumage above and buffy underparts, and orange eyes. This form is mainly found in arid areas. Bubo africanus cinerascens, from East and West Africa has browner plumage and dark brown eyes, with greyish-black facial disk. It is now included as a race named Bubo cinerascens – Vermiculated Eagle Owl. Both sexes are similar in plumage, with female larger than male. Juvenile resembles adults, but it is usually browner and less spotted on upperparts. Chicks are covered with dark grey down, finely barred with darker bars. 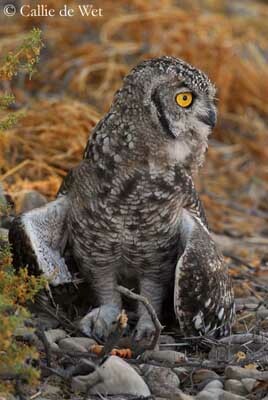 Spotted Eagle Owl calls when emerges at dusk and dawn, uttering a mellow, hooting “whoo hoo” descending in pitch. When alarmed, it utters loud “keeow”, and also performs bill-snaps. Male has double-note song “hu- hoo”. Female has lower-pitched call, rather dove-like “hoo doo doh dooh”. They may perform duets, giving the effect of one continuous call. Spotted Eagle Owl frequents in open woodlands, rocky hills and ravines, savannahs, semi-deserts and grasslands. Spotted Eagle Owl is widespread across sub-Saharan Africa, avoiding very dense forests and driest areas. We can also find it in some parts of SW of Arabian Peninsula, where is the race Bubo africanus milesi. Spotted Eagle Owl is a nocturnal hunter. It snatches from the air insects, bats and even birds, around the street lamps. It also hunts a wide variety of small mammals taken on the ground where it may run after them. It often hunts on road sides and at dusk. It dives on the prey from a perch and may chase it for long distances. It spends most of its time during the day, concealed in trees, but also on rock ledges, and even in burrows. It can roost in numerous places. Spotted Eagle Owl usually mates for life. Defence of the nest-site is done mainly vocally rather than by attacking intruders or predators. 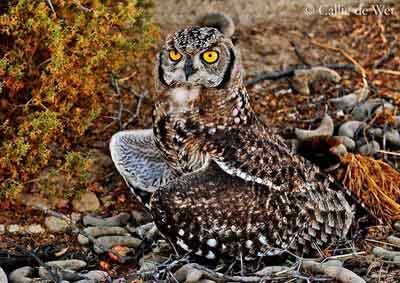 Spotted Eagle Owl is silent when flushed by day or seen at dusk. It flies with deep and strong wing beats, and with broad, fanned tail. 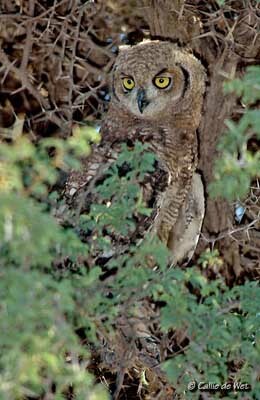 Spotted Eagle Owl may nest in a scrape against a fallen tree, a bush or a rock, on a rock face, on window ledges on buildings, or in a hole in tree, but it can also use an old nest of bird of prey. The nest-site is often used year after year, and some of them have been in regular use for decades. Spotted Eagle Owl also nests in boxes and it in gardens, near houses and in urban areas. It starts to breed in July, continuing to the first weeks of February. Female lays 2 to 4 eggs. Incubation lasts about 32 days, by female. She is fed by male during this period. Young leave the nest at about 5 weeks, and fledge at 7 weeks. They remain with parents for another five weeks or more. They are able to feed themselves at about 3 to 4 months. Spotted Eagle Owl feeds on invertebrates, small mammals, birds and reptiles. Spotted Eagle Owl is widespread and locally common. They often hunt near roads where they are often struck by vehicles, but the most important cause of death is the wide use of pesticides in agriculture, for population control of rodents and insects.